Discrimination at work is sadly a common occurrence. A recent study by Sky revealed that over a quarter of UK workers have faced workplace discrimination. 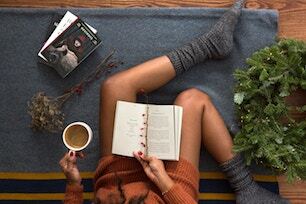 This experience can be highly detrimental to your mental health and well-being, and may be difficult for you to determine the best approach to move forward. It can be nerve-wracking to challenge the behaviour of others, especially if it’s coming from a senior member of staff, but know that you’re not alone and you have options. It’s important to understand discrimination and the two recognised types direct, or indirect. Direct discrimination might involve an employer not giving you a promotion based on your gender or race. Whereas indirect discrimination might involve a policy or rule that’s prejudiced: if you’ve lost your job because you’ve taken too much unplanned leave, but this absence was due to a disability or health condition. Based on this act, your employer is required to make ‘reasonable adjustments’ to your workplace, or policies, to rectify the situation if discrimination is happening. For instance, it would be a reasonable adjustment for an employer to allocate a disabled employee a parking space closer to the building. If your workplace is failing to comply with any adjustments, it can be considered a form of discrimination and you have the right to take action. If you feel you’re being discriminated against at work, or are worried about a friend or colleague, writer Alice from CV-Library shares a five-step guide on the steps you can take to dealing with the situation. With the Equality Act in mind, if you feel you’re being discriminated against, the first step is to document everything. 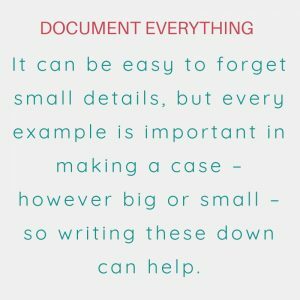 It can be easy to forget small details, but every example is important in making a case – however big or small – so writing these down can help. This will also give you specific examples to refer back to when you’re describing the incident further down the line. Be sure to make note of all the details, including dates, times and what was said or done. Also, gather any physical evidence you may have, this might be emails, voicemails or letters you’ve received. It’s best to start with informal action to see if the situation can be easily resolved. If the issue doesn’t involve your manager and you feel comfortable talking to them, they may be the best person for you to speak to first. If not, your HR department should be equipped to deal with these matters and will be able to advise you on how it can be resolved. So, set up a meeting and be sure to bring with you the evidence that you’ve collected. Prior to the meeting, think about what you want the outcome to be and the type of action you’re happy to take. Make notes to take with you if that will help, it can be difficult to remember what to say when under pressure, or in an emotional situation. Be sure to organise your thoughts logically, remain calm and explain how the situation is affecting you. If an informal meeting doesn’t resolve the problem, you can take your case further with a written grievance or complaint. Your workplace will have set procedures they must follow when someone files a formal complaint, so they can begin to look into the problem appropriately. Write a grievance letter that explains everything that’s happened and why the informal action didn’t resolve the issue. Keep the letter professional, to the point and factual. If the matter hasn’t been resolved from the steps above, you can consider legal action and make a court claim. The first thing you have to do is contact the Acas (The Advisory, Conciliation and Arbitration Service) early conciliation process. This means the matter will be discussed out of court, in order to reach an agreement or settlement without an employment tribunal. You’ll need expert advice at this stage, so it may be worth consulting your nearest Citizens Advice service where you’ll be able to get help from a legal point of view. You can then take the case to an employment tribunal if the matter is still in debate, where you could receive compensation for what you’ve been through. In order to move forward, it’s important to remember that a work environment should always be supportive. So if things don’t change, you might even decide that the best course of action for you is to search for a new job. You might also consider seeking professional help from a qualified therapist. A therapist can help you deal with what has happened, come to terms with the feelings you have been left with and ensure you don’t face further turmoil alone. Counselling will enable you accessible coping skills for the future. Read more about discrimination on our fact-sheet, and specific workplace discrimination, including Trans Discrimination in the Workplace on Happiful.